My mom and i had just got some candy at the store and was driving through downtown looking at this year's' christmas lights in the park. we were headed back to my house (east) and we were looking at lights in a neighborhood. i was seeing a long strand of red lights over everything slanted diagonally in a negative slope. i was thinking "there isn't a mountain or house here." i truly thought they were christmas lights. then i get my mom to pull over at east parker road and canterberry parkway, parker, colorado. i get out and immediately pull up an app i use for astrophotography on my iphone called nightcap pro camera 9.0. i get it on night mode, boost brightness, and start recording while i gather as much evidence i could. the lights moved over us (and i mean incredibly close) at a slightly positive slope and then began heading sw at a negative slope. the lights were red and blinked. when the red blinked a smaller, dimmer silvery flash occurred. they appeared to radiate one after another from the center. 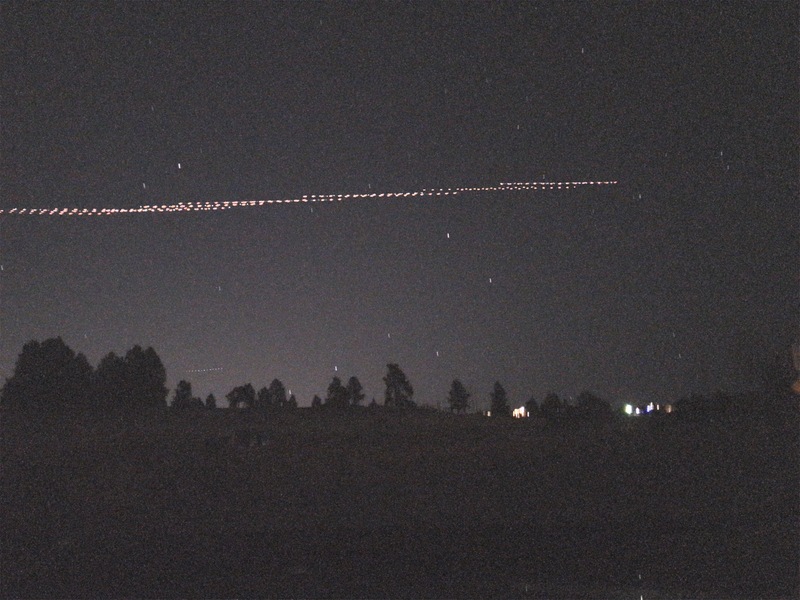 i do remember seeing darkish brownish trails. i knew that i needed to get the best shot i could for evidence. it was eventually so freakishly odd we had to just get home. we were able to see the objects continue out into the horizon where they were so close they looked like an irregular star cluster as they disappeared into the horizon. every time a plane or helicopter flies over me, i can hear it. what's so eerie about these lights is that everything occurred without the slightest of sound. absolute silence.